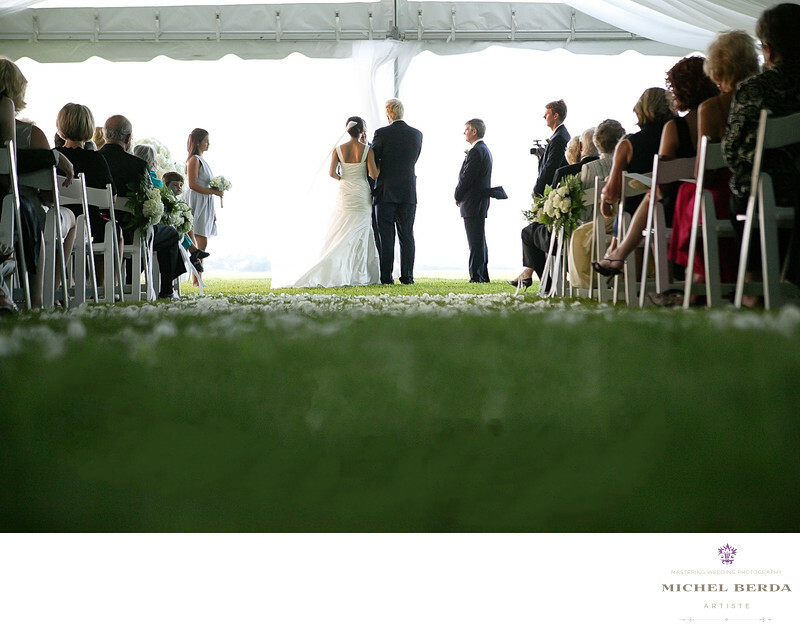 The ceremony how you see it and document it for your clients. Most of my weddings the bride and groom have a large bridal party most times up to 6 or more each and the family and friends are more then 100, that being said you have to be aware of the surroundings and give the respect of capturing the wedding ceremony without intruding on anyones view of the couple and bridal party. As for this image captured in Wilmington, North Carolina, at Figure Eight Island, the bride and groom decided to have a tent at their ceremony just in case in would rain. While the day was cloudy at Figure Eight Island, it still gave comfort for the couple, that they had one. I moved to the back, and I decided that I would go completely down on my chest that was touching the grass and include on both sides the family and friends, while I love how your eye travel threw the grass and petals and leads you to the couple, I also dialed my exposure to blow out the background, strictly knowing that the darker foreground would pop and that was key to this ceremony wedding image.Keywords: Destination Wedding Photographer (117), Figure 8 Island (6), Figure 8 Island NC (6), Figure 8 Island North Carolina (6), NC (6), North Carolina Figure 8 Island (6), Wedding photographer Figure 8 Island NC (6), Wedding Photographers (198), Wedding Photography (123), Weddings (168).